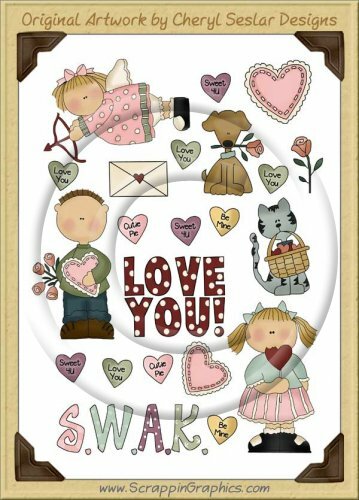 This collection of 17 adorable and cute Valentine clip art graphic come in one sheet. Great collection for making scrapbook pages, cards, labels, tags, invitations, and other printables. Graphics cannot be separated to create new clip art sets for resale. These large 300 dpi graphics work well for your printing and crafting needs but can easily be reduced in size for use in web designs. The sheet comes in high quality JPG format only. You are purchasing the rights/license to sell theses commercial use graphics on your website. Graphics have to be sold AS IS and cannot be separated. Set your own price and sell how many as you would like for as long as you like. Credit with links to Scrappin' Graphics and Cheryl Seslar is required on item's page. Please read our Reseller Graphics Terms carefully before purchasing.